Ohio State University's "Ohio Union" dates back to the early 1900s, a time when there were less than 2500 students. There were no dormitories, but it was thought that a place where the mostly male student population could gather would be important. Student interest convinced Ohio legislators into appropriating $75,000 for the project and in 1910, a 3-story brick building officially named "The Ohio Union" opened to the public. It was only the 4th such building in the country, and the first for a public university. In the early 1920s, the Ohio Union played an important role in the development of the Ohio Stadium. The students turned over the entire 2nd floor of the building to the Ohio Stadium Building Committee. Here, plans were created to not only get the Ohio Stadium project funded, but to get the city of Columbus involved in the project. Fund-raising parades were designed that traveled south on High Street to the statehouse. It was in large part due to the involvement of the students at the Ohio Union and the citizens of Columbus, that would make a lasting bond between Columbus and the university's football program, unlike any other in the country. The Ohio Union remained at this location until 1951, but because the student union was for men only (women were allowed once a week), another structure, a Women's Building, was constructed a few years later. This became known as Pomerene Hall and served as the Women's Building until 1951. With the opening of the 1951 Ohio Union, both the men's and women's buildings were converted for other uses. The original Ohio Union became Enarson Hall and became the Student Services Building. When the structure was given Historical Landmark status, plans to tear down the structure were cancelled. The building then became the center for Undergraduate Admission. When the new Ohio Union opened in late 1951 it was one of the largest college unions in the country. Amenities including dining facilities, 2 ballrooms, library, music lounge, 18 pool tables and a 16-lane bowling alley in the lower level. 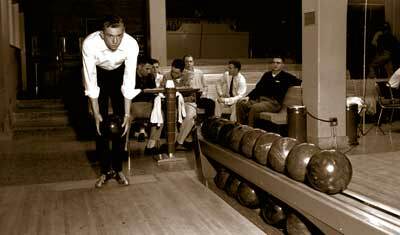 1955 bowling at "Union Lanes"
The 1951 Ohio Union was originally created for the students to learn the social graces. Men were expected to remove their hats when they entered the building, doors were held open for the ladies. As the times changed, so to did the focus of the Ohio Union. In the early 1980s computer labs were added in addition to the bowling lanes. By the 1990s, the now 40 year old building was beginning to show its age. It was going to cost $10 million just to maintain the infrastructure. When plans were unveiled in 1994 for a complete renovation of the building, student protests brought the plans to a halt. In 2001 the Ohio Union received a new coat of paint and a return to Buckeye traditions in the decor of the facility. in 2004 plans were approved from both the trustees and the students to build a new Ohio Union on the same location. With the cost of land and the cost to maintain the existing building for some other purpose did not make economic sense and demolition made room for the new Ohio Union, which opened in the spring of 2010. A bronze Brutus Buckeye sits on a bench in the new Ohio Union that opened in the spring of 2010. This work of art was created by Ohio State University alum Renate Burgyan-Fackler who has been creating sculpture for the last 20 years. She now has a studio in Zanesville, Ohio.